It's been two years since I started this blog! I've really enjoyed it and have had such a good time "meeting" many of you in the comments. Even while I'm on my trip I want to thank you for checking in from time to time. So, I'm having a little blog contest. Please leave a comment on this post and I will compile them all and choose a random winner to receive a prize. The cool thing is that I will tailor it to your passions. 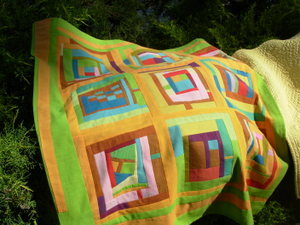 If you're a quilter, it'll be a fabric goody. 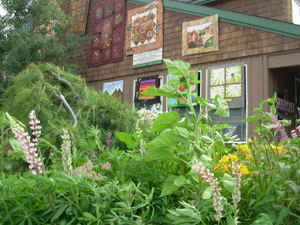 If you're a knitter or crocheter, it'll be a fibery prize. I'll notify the winner by email and then you can tell me what you prefer. Doesn't matter where you live either! So, join on in and let me hear from you! You have until August 7th at 5 pm. I have been doing something other than admiring quilts lately. This is a shrug I'm making for Chloe to wear to her best friend's Bat Mitzvah. This is a Louisa Harding pattern, but it's made from Rowan Calmer. Calmer is really a lovely yarn to knit with and has wonderful stretch. I'm up to the sleeves, so should be done in plenty of time for the September 1st party. I'm also working on a pair of plain vanilla socks. These are done toe up and are Wendy's basic pattern. I'm making these with my skein of Cockamamie I got from the Blue Moon Fiber Arts Sock Camp. I really love this colorway and I like how the stripes are knitting up. I'm taking this on my trip, so you may see more progress in a couple of weeks. 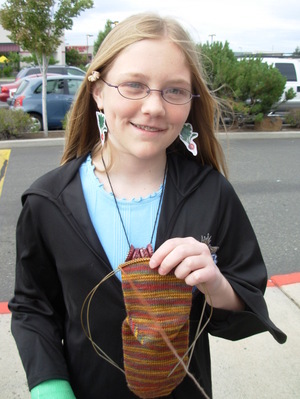 This was just the sort of thing for knitting while standing in line for the Harry Potter party last Friday. Here's Chloe, as Luna Lovegood, modelling this sock. 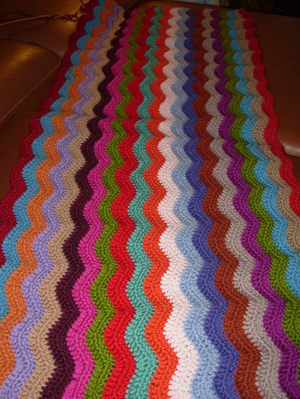 Lastly, the ripple blanket is coming right along. I seem to go to this one whenever I'm too tired for anything else. I find it soothing and can just imagine using it this winter. It's too big to take on the trip and, of course, there are too many balls of yarn to bring, so it will be waiting for me when I get back. Well, this is my final post from the show. 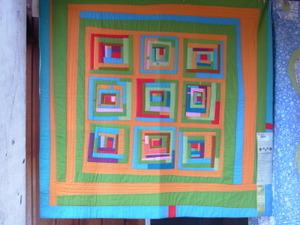 It sure has been fun showing you all these wonderful quilts. I'll be putting them in a photo album on the sidebar when I get a chance. 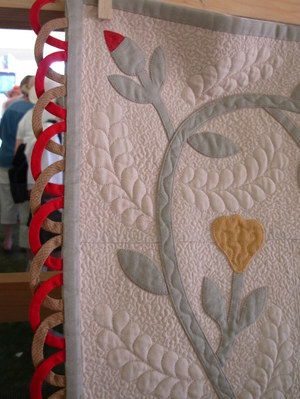 By the way, did you know I have albums of the quilt shows from 2005 and 2006 down there on the right hand sidebar? Take a look there to see more wonderful inspiration. Click to see photos bigger. 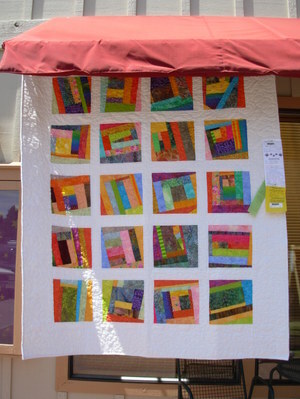 These first several quilts were located outside the Paulina Springs Bookstore, which is definitely worth a visit if you make it to Sisters sometime. 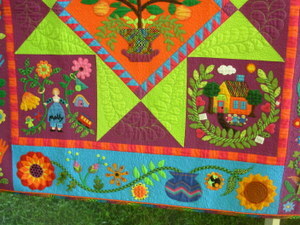 I love the bright colors and free pieced blocks in this one. This one is obviously inspired by Gwen and Freddy. I love the free pieced trees! 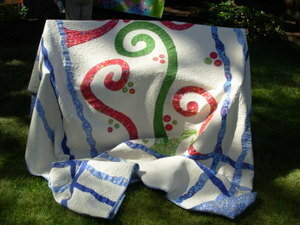 These next few are by one quiltmaker, but I don't remember the name again. Let me know if you recognize the quilts. I think they are simply amazing. 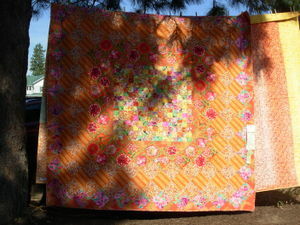 This is the beautiful quilting on the above quilt on the right. This is the spot I was in charge of during my hostessing stint in the afternoon. 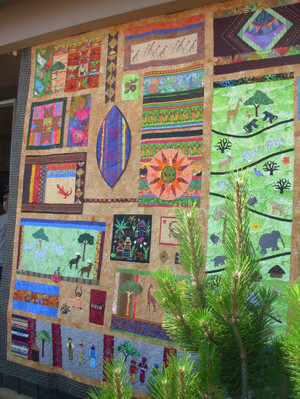 There wasn't much shade, except on the porch, but it was interesting to see how people react to the quilts. 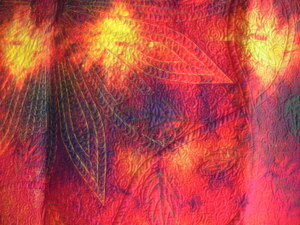 I love this design, which seems to be related to one that Kaffe Fassett did. I have wanted to try this myself, but with brighter colors. 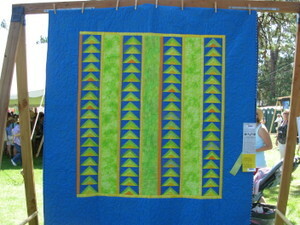 This was the most popular quilt in the group I was watching. The corner was constantly blowing up in the breeze, but everyone wanted a photo of it. 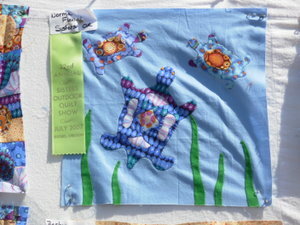 This end of the Stitchin' Post is the first place to be decorated with quilts in the morning of the show. The local firehouse sends out firefighters to help put them up. These are all done by employees of the Stitchin' Post according to the theme of the year. This year's theme was, "Inpsired by Nature". 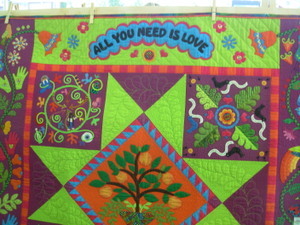 This is Jean Well Keenan's quilt for the theme. 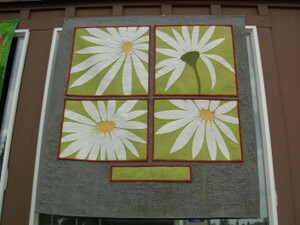 I've often thought of doing a large flower quilt, but just haven't gotten to it. Jean's technique is based on her book, Portraits from Nature. 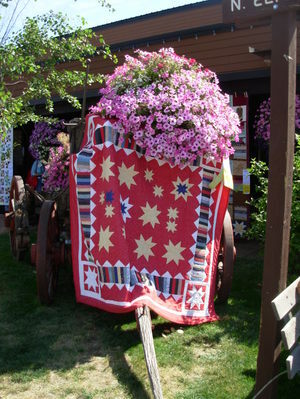 The flowers are small quilts attached to the larger one. I thought this one was just so complicated and beautiful. I like the addition of the applique. 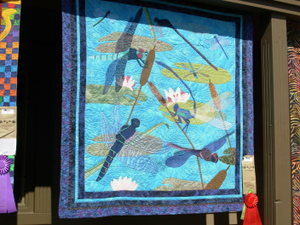 It really makes the quilt come alive. I hope you enjoyed the virtual tour! Next up things with yarn. 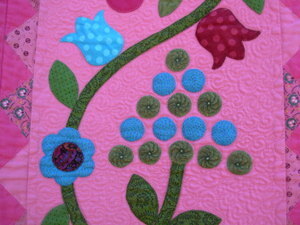 I have been doing other things besides quilting lately. Also, I'm off on a trip to New England to relax at the beach and the lake and see Mark's family. I hope to have a couple of posts set automatically, but if I don't get to that I'll be back in early August. This is the first year I participated in the block contest for the show. 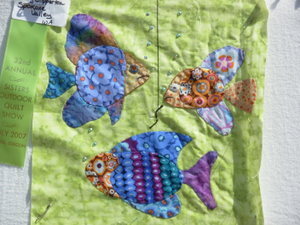 When I saw the fabrics included I really didn't know what to do with them for a while, but I knew I wanted to applique. 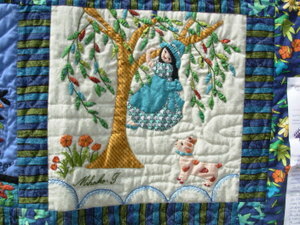 I ended up making a fanciful house block adding just two other fabrics (the background and the tree fabric). When I got to the show, one important task was to find where the blocks were displayed to see if I had won. 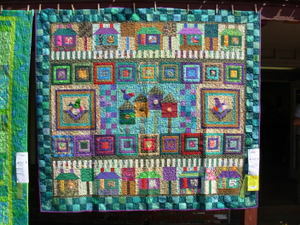 Winning puts you into the drawing for a finished top made of 12 blocks from the contest. I was thrilled to see that I had, indeed, won the first part. 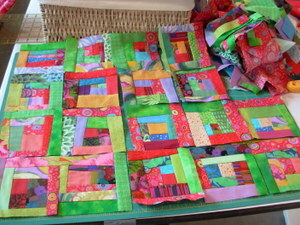 These blocks are arranged into tops (usually 3 or 4) and sewn together by someone at the Stitchin' Post. Those who don't win the top get a photo of the top and a ribbon. Winners of the tops receive notification in early August. There were so many gorgeous blocks. I guess I was drawn to the appliqued blocks. There were a lot of pieced ones too. Remember to click to see bigger. This chicken was my very favorite. 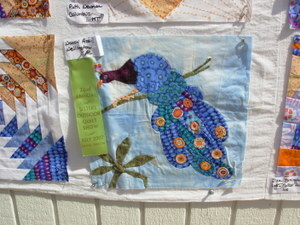 I just realized I didn't get a photo of the grand prize winner, which receives a $50 gift certificate to the Stitchin' Post. I can't even remember what it looked like- darn! 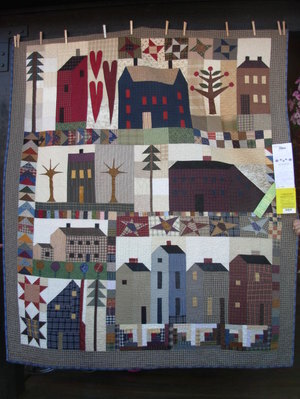 To close, here's a photo of a quilt in the show that was a block winner of 10 years ago, I think. These are beautiful blocks. Is it just me, or do these older blocks seem to have a lot more detail? 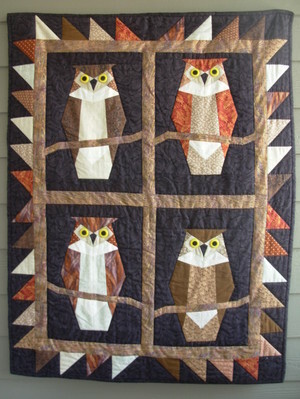 I think this quilt is just fantastic. I can only hope I get to be a winner this time, but this was such an enjoyable experience I would definitely do it again. I also urge any of you to try it too! 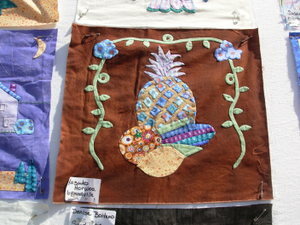 The teacher's tent at the show had an amazing variety of styles and the quilts were gorgeous, of course. Click to see the photos bigger. ** Edited to note: I had two helpful readers tell me the name of the quilter who made these first two quilts is Sue Nickels. 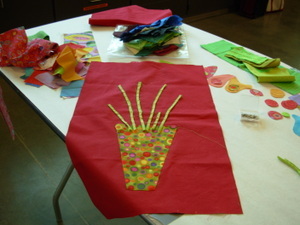 The machine applique and quilting are absolutely amazing! This first one is inspired by the Beatles. 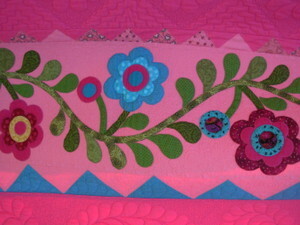 I love the four different columns of applique. 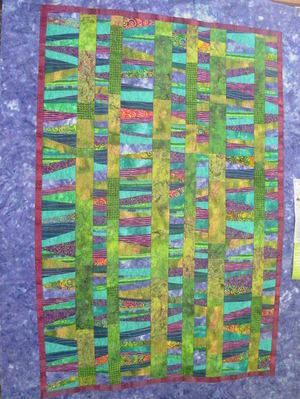 This one just had the right color mix and I love to see wonky piecing. 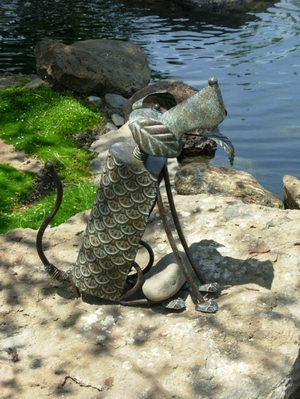 These next two are from Sue Spargo, who has a very distinct style. I like her motifs and have a couple of books that I use as inspiration. 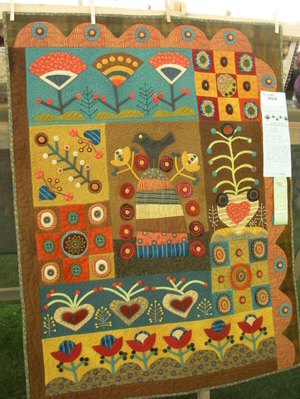 She uses combinations of felted wool and cotton fabrics so the surface of her quilts is very different than a traditional cotton quilt. 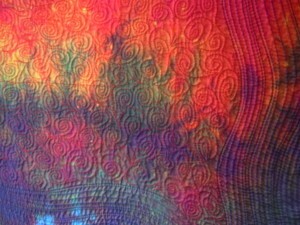 She also has nice embellishing techniques which make the surface more interesting. I wasn't able to take a class with her because they were full when I checked, but it was great to see the quilts in person none-the-less. 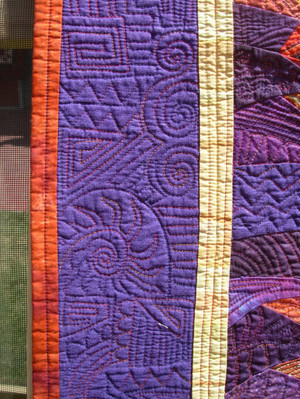 I realized that I don't have a full view of this next quilt, but I guess I was just amazed by that binding detail! Can you imagine doing that?? 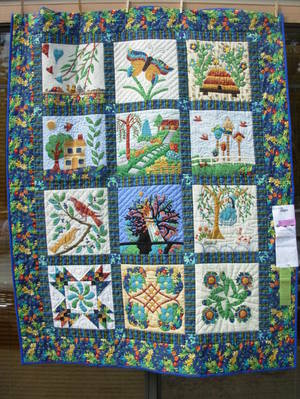 These next few are quilts by Jean Wells Keenan, who is the owner of the Stitchin' Post and a fabulous teacher. These quilts were hung in the Sisters Library so the lighting isn't as good. 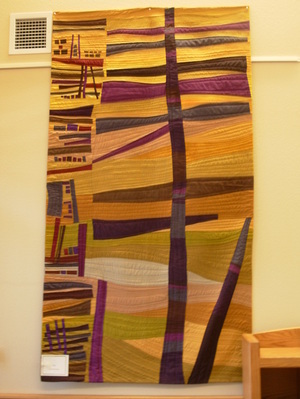 She is doing some really wonderful abstract quilts now and I love her color themes. More from the Show. Click the photos to see them bigger. Notice the yellow tags on some of these. Those were for sale. 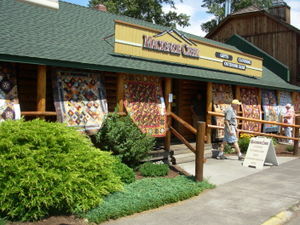 I never pay attention to that when I'm there because I'm only looking for inspiration, but my goodness, there were some gorgeous quilts for sale! 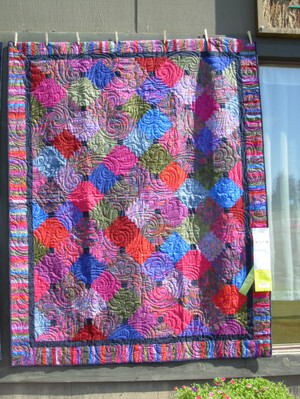 This first quilt was in front of the Stitchin' Post and I have to say I saw it from the back first and was so intrigued with the beautiful quilting that I went around to the front. Here are two shots of the back. I love this one for the colors and variety of blocks. Houses and birds always make me happy. A typical Sisters vignette. I like how there is variety in the sizes and placement of the stars. Makes it more interesting. 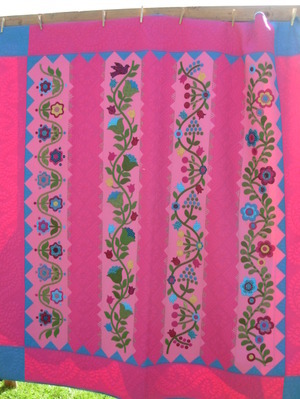 The striped inner border is unusual too, with the triangles along it. 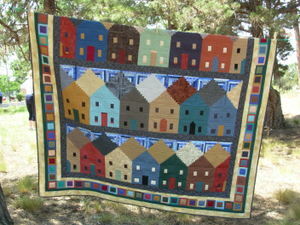 Like I said, I love houses in quilts. 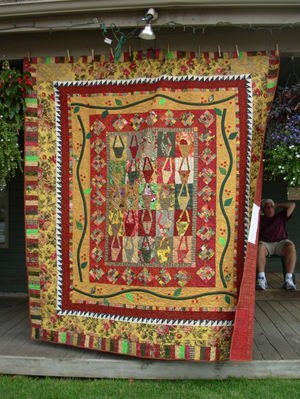 This one gives me lots of inspiration for my own house quilt someday. I knew this looked familiar. Take a look at this one from last year's show for a different colorway. 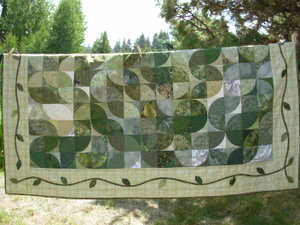 I just love this sweet, simple quilt. The colors are paler than I usually use, but the robin's egg blue really sets it off. I also like the use of Kaffe Fasset prints with the large motifs getting their own patches and the smaller ones surrounded in squares. These next two are by Joanne Meyers who is a member of our guild. 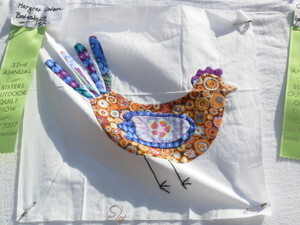 She is a wonderful quilter and makes especially beautiful applique. 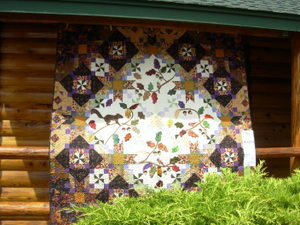 These two designs are from the book, Amish Inspired Quilts, which is also one of my favorites. I saw Joanne when she first got this book and knew she'd make something gorgeous. All those triangles are appliqued. The colors in this photo are off. This is even prettier in person. 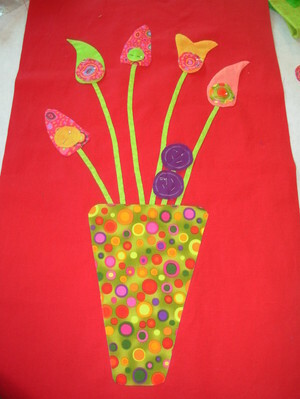 This one I love for the colors again (red and green combos always appeal to me). 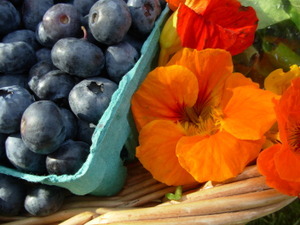 The free-pieced baskets are really sweet and the multiple borders are nice. This one was across the street from me while I was hostessing, so I had to take a closer look as soon as I was done. 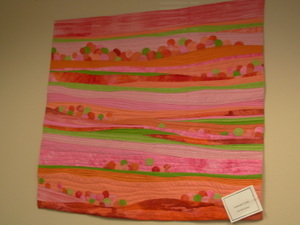 This quilt is by local quilter, Wendy Hill, who came to our quilt guild recently to talk about her quilts. 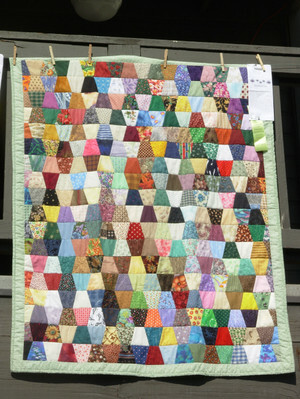 This quilt is from her book, Easy Bias-Covered Curves. I'm not sure if I'll ever try this technique, but the result is striking. Well, I've still got at least two more posts to go. 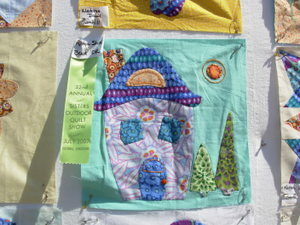 I've got photos from the teacher's tent and photos from the block contest. Both are worth waiting for! 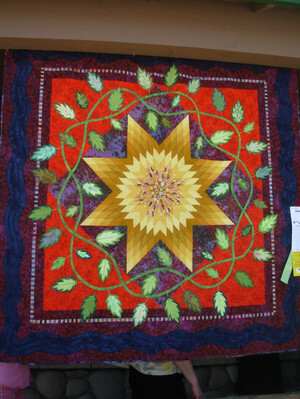 Some selected quilts from the show, more to come later. These appealed to me for various reasons, but I'm usually drawn to color first, then design and workmanship. Enjoy! Remember to click on the photo to see them bigger. There were too many people in front of this one to get a full size view, but I just love the color and use of those large motif fabrics. 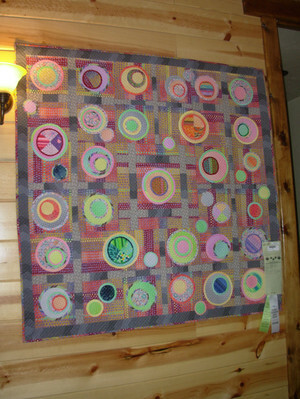 This one appealed because of the use of the circle fabric in the centers. Click to see them better. I always love a good courthouse steps and this one has beautiful colors as well as that zingy striped border. I love one patches and thought this one was very sweet. I have this template in a book, but don't know that I would ever do it myself. Sorry this one is in bad light. 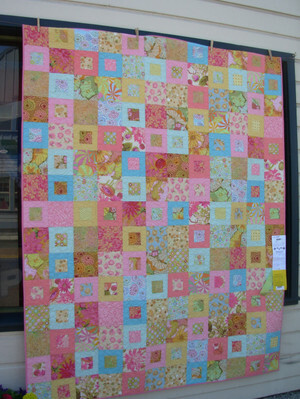 It is really gorgeous in person and a nice use of these floral fabrics. 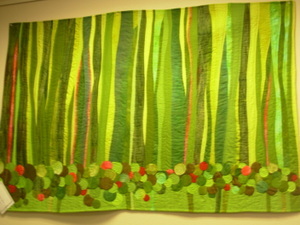 The next four quilts are from featured quilter, Betsy Rickles. She uses color in ways that I find really exciting. These crazy log cabins are wonderful! I love the colors in this one even more. Notice the variations in the centers of the blocks on this one. 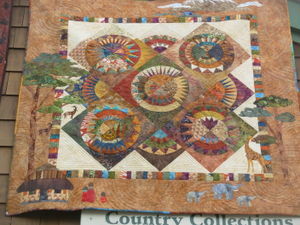 This is a great example of the kind of free piecing that Gwen Marston does. 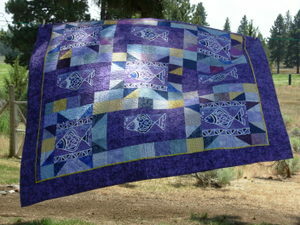 This one is also unusual in that it's finished as a summer quilt. That is, there is no batting or backing and it's not quilted. The edges are turned to the back and hand sewn down. This one is so happy it makes me smile every time I look at it. I love the colors and all the different blocks. So much to look at, you could stare at it all day. 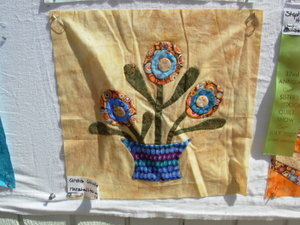 This large applique really caught my eye. I wish I could see a full view. This last one is not Betsy's. 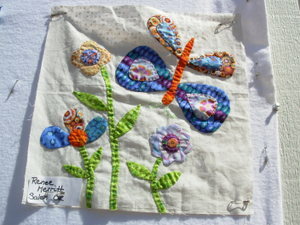 It was in front of the Stitchin' Post and I really loved the variations all over the surface. There's a lot to look at here too. 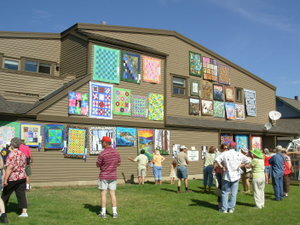 The Sisters Outdoor Quilt Show is billed as the largest outdoor quilt show in the world. 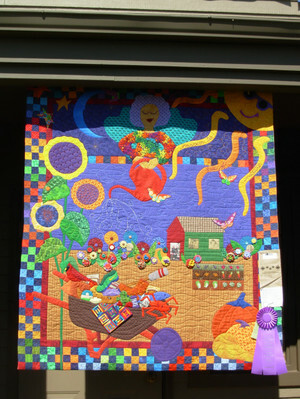 It's pretty impressive to see over 1200 quilts hanging along the streets of this quaint little town in the High Desert of Central Oregon. They say that there was only one time in the past 32 years where weather interfered with the show and I think that was at the end of the day. 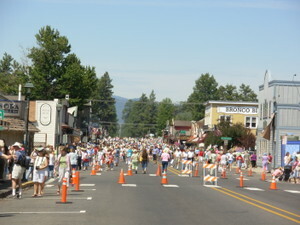 It's always held on the second Saturday in July and is a huge money maker for the whole area. Hotels and campgrounds are booked well in advance, so if you plan on coming sometime, make your reservations early! This year they closed off the main street in town and I thought that was really great to not have to worry about all the traffic and the engine fumes. This year I decided to take it easy and not to try and see it all, as I have for the past 3 years. I was on my own this time which was actually more relaxing as I could go at my own pace and only stop when I wanted to. I did miss having my mom, Chloe and my sister there and I hope that some or all will be with me next year. 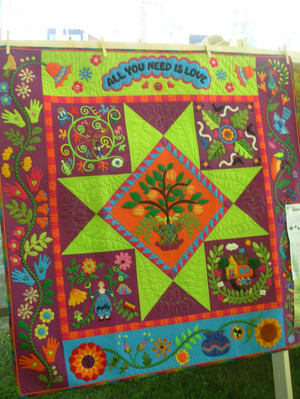 The quilts are pretty spectacular and there are special groupings around town for highlighted quilters or the quilt teachers at the Stitchin' Post. 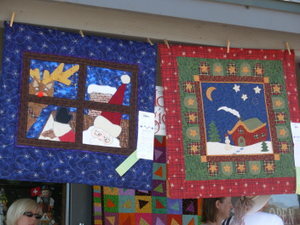 Most of the quilts are there only for display, but they also have a special theme contest each year. I didn't enter the theme contest which was, "Inspired by Nature", but I really enjoyed the entries. 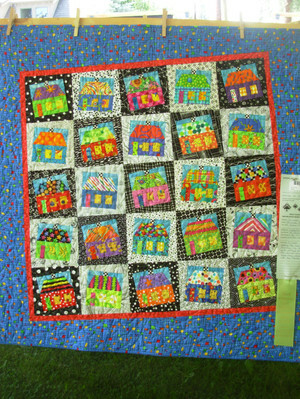 There are notes on each quilt stating the name of the quilter and other info about the quilts, but I didn't take note of the quilter's names. If you see yours here and would like me to identify you, please let me know! 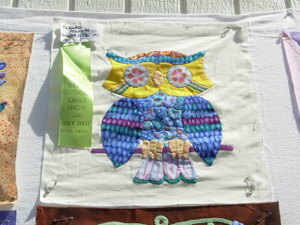 I entered three quilts in the show. 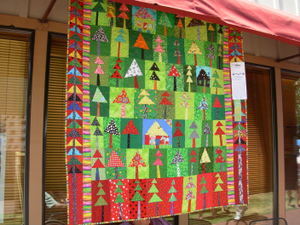 Two were in the regular part of the show, the witch quilt and the Christmas cabin quilt which I showed earlier. 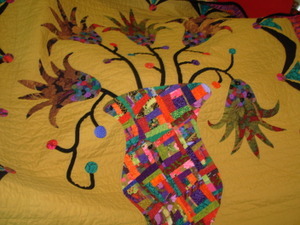 The third quilt is the one I have in the banner and About icon you see above. 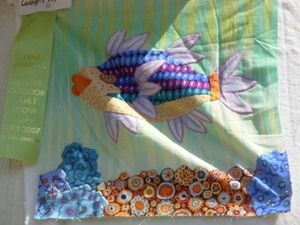 This one was a sponsor quilt and spent all week in one of my favorite shops in Sisters, Paulina Springs Bookstore. I was thrilled to find it was in there! 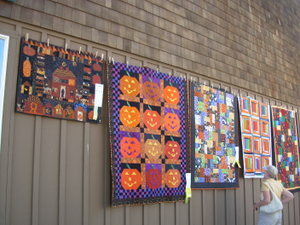 My quilt, "The Witch is In", is on the left. 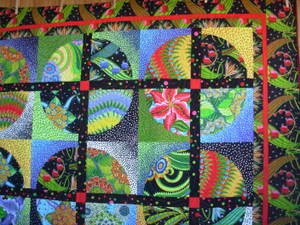 Over the next few posts I'll show you various quilts that appealed to me. I've got loads of photos so it may take a while, but I hope you enjoy this virtual tour of the show. 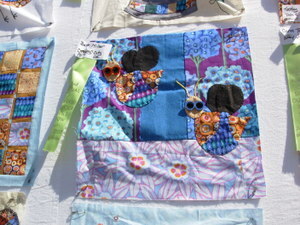 Edited to add: I just found this photo gallery at the quilt show website and one of my previous quilts is in one of the photos. It's in the last photo of the 2006 section. It's the pink/red one on the upper railing. 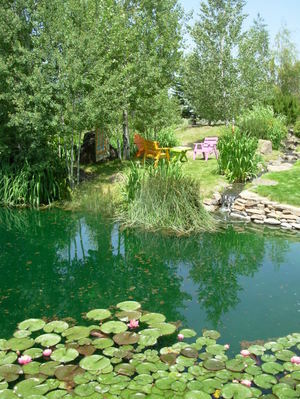 Last Thursday Chloe and I did the Sisters Garden Tour which is put on in conjunction with the show. 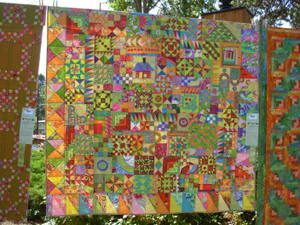 They have lots of quilts in the gardens and I thought it would be nice to get out and see other parts of Sisters. As it turned out, it was about 95 degrees and while it was interesting I probably don't need to do it again. There were 5 gardens altogether and 3 of those had the house open as well. 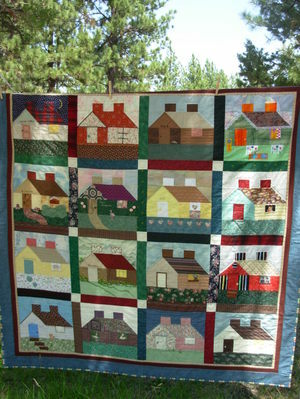 Only one was the house of a quilter. This house was so busy that the first time we drove by there was a line, so we came back later. 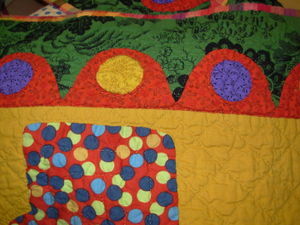 She did have some marvelous quilts inside. I love these owls. 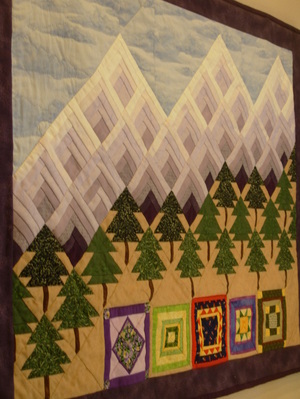 This quilt depicts the Three Sisters (mountains in the Cascades which dominate the skyline here). 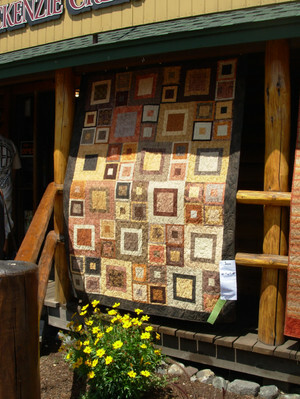 Next time, quilts from the show! 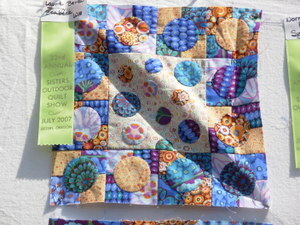 Last Saturday was the Sisters Outdoor Quilt Show and the week before the show is called Quilter's Affair. There are an amazing number of activities you can choose to do during the week. 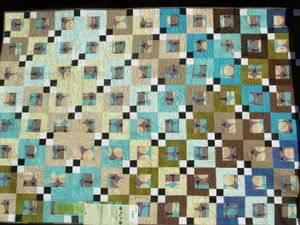 This year I had planned on several things and it started with a quilt class taught by Tonye Belinda Phillips. I chose this one because I really liked the project. Tonye came to our guild recently to talk about her work. 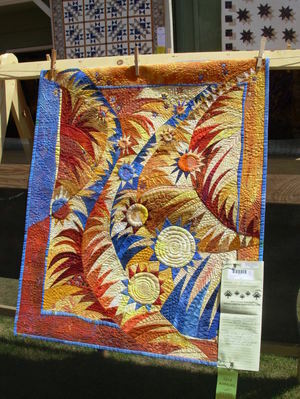 She's a local quilter and has some amazing collaborative projects with the painter who designed the artwork for this year's show. 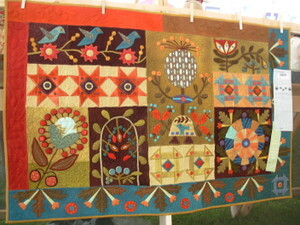 She also has a folk art style of applique that I really love. This is my first block. Here are the crazy log cabin blocks I worked on the second day of the class. 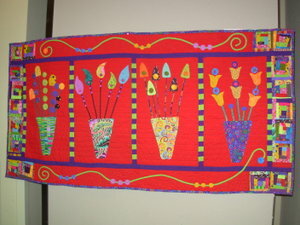 I really enjoyed seeing some of Tonye's other quilts including this over-the-top vase quilt. This is a really cool way to make a fancy border. 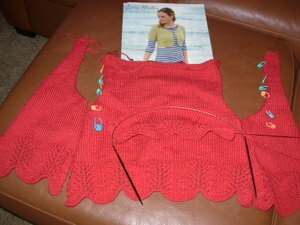 She basted a long straight strip of red to the top of the green, then marked and cut the scallops and appliqued them down. Truth be told, this is a class I probably could have taught. 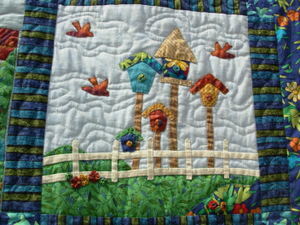 I'm good at applique and I love making crazy blocks like those log cabins. However, I did learn two good things. 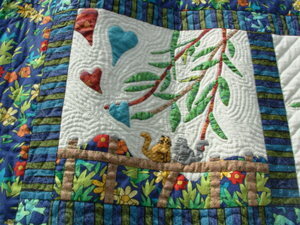 How to needle turn those little appliqued circles, for one. I had been using the basting method where you baste around the circle, pull the thread tight around a template and iron it before taking out the template and then appliqueing it down. I forced myself to do it with only the needle turn and I like them. It's much quicker and I figure I'll get better at it as time goes on. The other thing I learned is how to make the stems you see up there. It's really quick and easy if you have the right tool. I'll show how to do it in a later post. 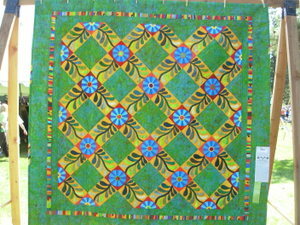 Next up, more photos from Quilt week including the show. 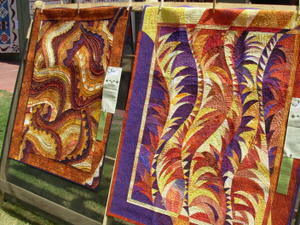 My, there were some spectacular quilts there!